Before Martha Stewart named him her “pet keeper,” and before millions of people turned to him for advice, Marc Morrone had a simple dream: to learn everything he possibly could about every kind of animal and share that knowledge with others. In this lively, colorful memoir, Morrone offers a heartfelt and candid look inside a life well-lived with creatures great and small, from the domestic to the exotic, from frisky ferrets to renegade reptiles to rare parrots. Morrone is an enthusiastic champion of all animals—furred, feathered, or scaled, domestic or wild—and his lifelong adventures take us from his internationally renowned pet store, Parrots of the World, to his home and personal menagerie, covering his media roles on both television and radio. Inspiring, informative, and frequently amazing, Morrone’s story is a memorable tribute to one man’s passion for the world of animals and his enduring commitment to their care. 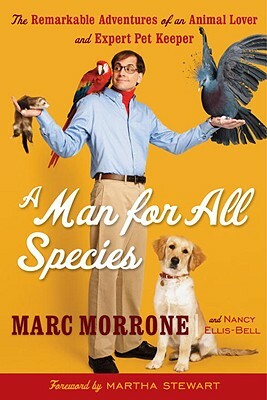 In A Man for All Species, animal expert Marc Morrone weaves thrilling, inspiring, strange, and often hilarious experiences with practical advice gleaned over his forty-year career, revealing a world of adventure and anguish, humor and heart, that every pet owner and animal lover will recognize. MARC MORRONE is the co-owner of the Parrots of the World, Ltd., pet store in Rockville Centre, New York, and is also Martha Stewart's pet expert, appearing regularly on "The Martha Stewart Show "on NBC. Additionally, he hosts "The Pet Shop""with Marc Morrone "on Mag Rack and is the host of the radio show "Ask Marc, the""Pet Keeper "on the Martha Stewart Channel. NANCY ELLIS-BELL is the author of "The Parrot Who Thought She Was a Dog, " which was named one of the Top 5 Nonfiction Books of the Year by the "Richmond""Times-Dispatch "as well as one of the Top 10 Sci-Tech Books of 2008 by "Booklist." She is a literary agent and lives in California with her husband, Kerry, and their menagerie of cats, dogs, and birds.